Minister of State for Community Development, Natural Resources and Digital Development, Mr Sean Kyne T.D speaking at the ICF Annual Seminar, October 2017. 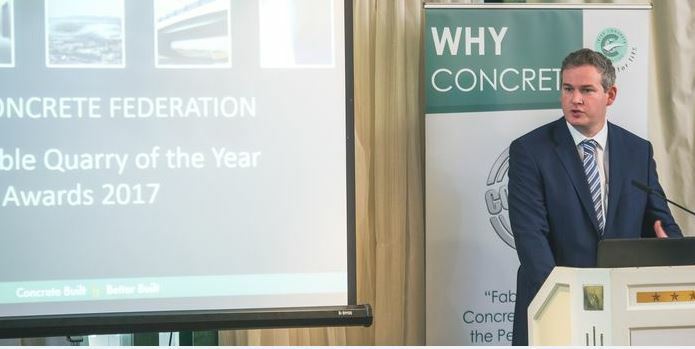 The Irish Concrete Federation (ICF) engages with EU institutions, government departments, local authorities, regulatory bodies, educational institutions and other trade and professional bodies to promote a positive business environment for our members. As key employers in their locality and suppliers of the essential materials which underpin the development of local infrastructure, it is essential that policy makers are fully informed on the key issues impacting on the sector. Policy areas to the forefront of ICF advocacy include transport, environment, regulation, technical standards, education and health and safety. ICF has produced many policy documents, submissions and guidance documents on each of these areas, some of which can be found in the Publications section of this website. ICF policy is formulated through the active participation of members on our policy committees. These committees harness the expertise of industry participants to inform overall ICF policy. A full list of our committees is available in the About ICF section of this website. ICF holds regular events and seminars to inform members and other interested parties on various policy issues which impact on the sector. The following pages provide information on some ICF activities across a range of policy areas.